Gesellschaft und Wirtschaft was a monumental collection of one hundred statistical charts printed on loose leaves. Due to a generous commission from the publisher, money was no object and the Vienna team expanded by hiring outside consultants for this publication. The chart above (no.56) is titled 'Numbers of motor vehicles in the world' (USA and rest of the world). Even if one cannot read German, the subject reveals itself through the 'speaking signs' of the automobiles, each of which represents 2.5 million vehicles. 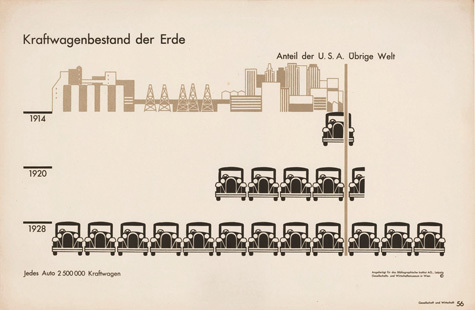 The grey/brown 'guide-picture' (as Neurath called it) at the top of the chart gives further context 'outside the root picture', in this case indicating the greater industrial development of automobile production in the USA. 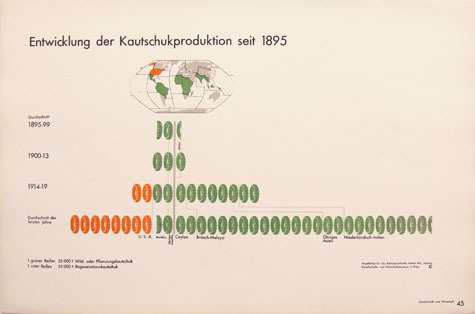 In the chart above (no.45), titled 'Development of rubber production since 1895', green tyres represent 25 thousand tonnes of wild or cultivated rubber, and orange tyres represent the same amount of recycled rubber. These colours also provide a link to the map at the top of the chart, in which they are used to mark the parts of the world where the different kinds of production take place.